The star Bandô Mitsugorô III performed in the 6th lunar month of 1826 at the Ichimuraza in a 3-role Kiyomoto-based hengemono entitled "Mata Koko-ni Kabuki no Hanadashi". The 3 roles were Take-no-Uchi no Sukeneya (a legendary character famous for his extraordinary long life), a fisherman fighting a giant octopus and a tekomai festival dancer. The fisherman and the dancer are nowadays independent dances, which are staged under the respective titles of "Omatsuri" and "Amiuchi". A stylish and gallant Edo fireman boss is drawn into the merriment of the Sannô Matsuri, one of the main matsuri of the city of Edo. With the local youngsters and/or tekomai courtesans as his partners, he dances in the streets, expressing the air of excitement of a summer festival through his dance. "Omatsuri" is considered as an auspicious dance for a star, who stages a comeback after a long sick leave. The number of dancers is not fixed. 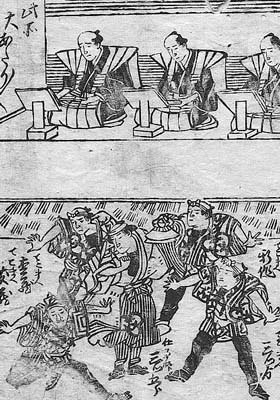 It is possible to stage "Omatsuri" with or without tekomai courtesans. 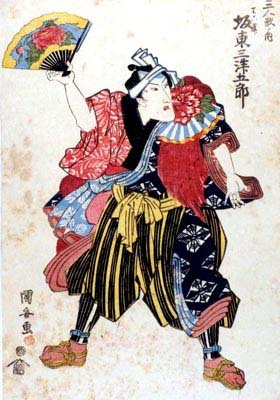 An illustration taken from the illustrated playbill of the dance "Mata Koko-ni Kabuki no Hanadashi"